– various cucumbers & summer squash/zucchini – These are all slowing way down right now, especially the squash/zucchini due to powdery mildew, which always comes in late summer. – carrots! – nice bigger ones now – though some have a bit of carrot rust fly damage which you can find as brown spots or trails – just cut them out with a knife. – various tomatoes – mostly small ones from the field plantings. The big heirlooms in the hoophouse have slowed way down. – eggplant (asian long “Ping Tung Long” from Taiwan and/or regular medium/large “Black Beauty”) – the asian variety are great in stir fries and curries. – cut lettuce salad mix – Some of this is a little bitter right now due to the heat, but with a nice strong dressing I didn’t even notice and hopefully you won’t either. Tuesday’s share got more cukes and summer squash while Thursday ended up with more eggplant and peppers – that’s just how the harvest fell out this week. Well, what is going on at the farm besides harvesting for CSA? Harvesting for storage! 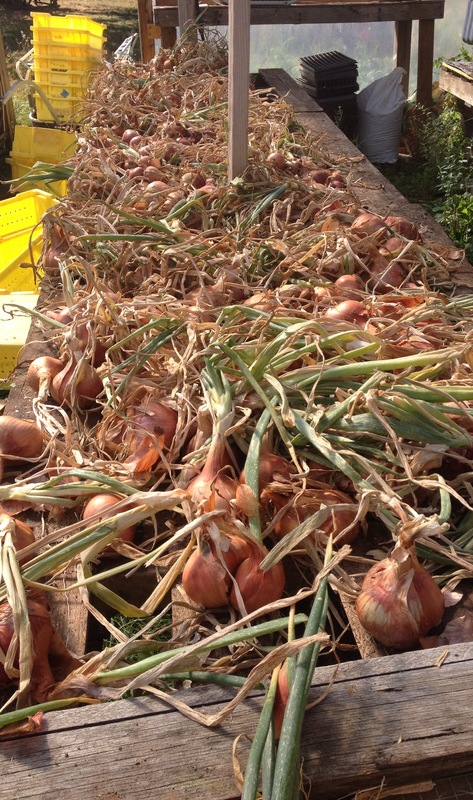 We’ve pulled all the rest of the onions out of the field and they are now drying down in the greenhouse. After a few weeks of that they’ll be ready to trim and clean and store in a cool place. 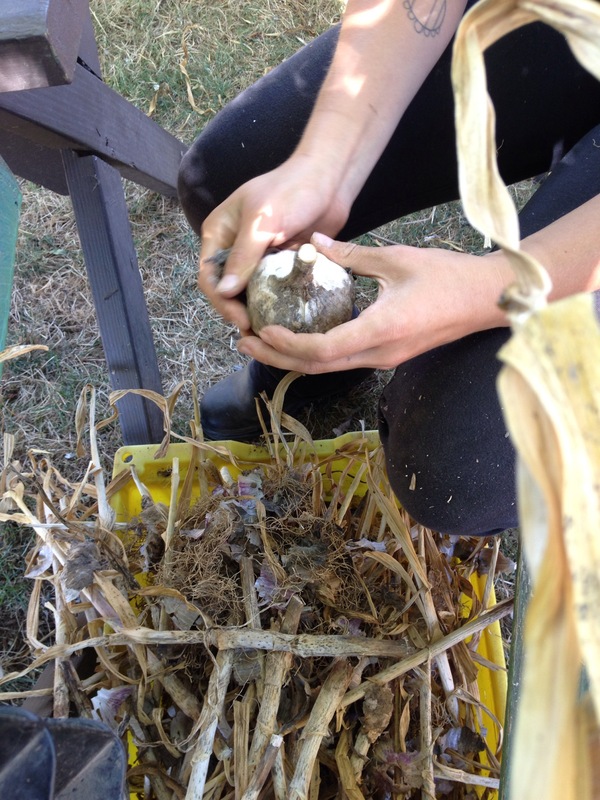 The garlic has already been cured and now we’re getting around to cleaning it up for storage. Here’s Della peeling the dirty outer skin off a garlic head to reveal the nice clean skin underneath. Other than that I’ve been seeding salad greens for the fall and trying to stay on top of the late summer weeds. Here’s to another week of yummy CSA produce!